rob mclennan's blog: Julie McIsaac, We Like Feelings. We Are Serious. Every loss I have ever felt has registered in my brain, marked my body, and influenced all of my relationships. I know that you feel the same way. Please believe me, I want sincerity most of all; however, I am saddened and frustrated to find that I, too, am tyrannized by irony. 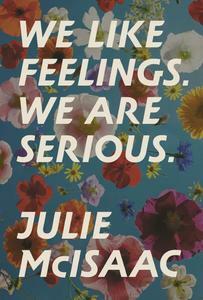 From Hamilton, Ontario writer Julie McIsaac comes the expansive and powerful We Like Feelings. We Are Serious. (Hamilton ON: Buckrider Books/Wolsak & Wynn, 2018), a poetry title that follows on the heels of her debut short story collection, Entry Level (London ON: Insomniac Press, 2012). McIsaac’s debut collection of poems rages against numerous oppressive systems while highlighting the often-unspoken traumas of female experience, composing poems as journal entries, and questioning her own behaviour as much as she shines a spotlight on the behaviour of others. I am browsing the Feminist Archives. I heard about this place through graffiti on a bathroom stall. Because there’s no money in the budget for little pencils.